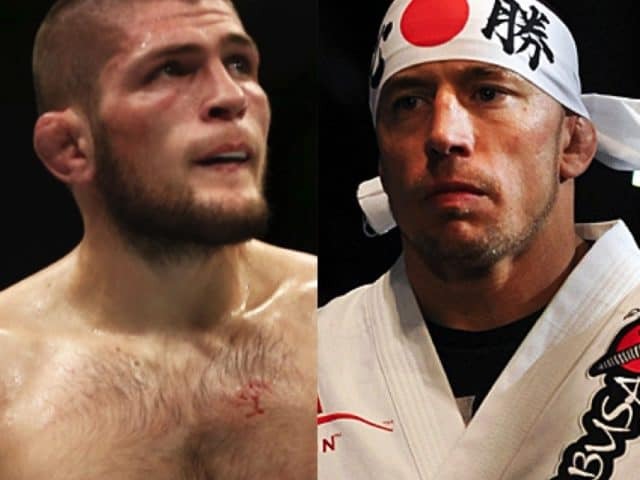 Georges St-Pierre’s coach thinks he has the best match-up for the former UFC middleweight and welterweight champion in mind. That would see him compete in the rumored UFC 165-pound division that has been pitched heavily by fighters. St-Pierre went on record before his last fight by saying that the reason he is returning to MMA to cement his legacy as one of the all-time greats in the sport. He fought once and then stepped aside due to an illness. While doing a recent interview, GSP made it known that he will make a decision if he wants to fight again soon. If he does return, then fighting 5 pounds lighter than he used to would be perfect. Thus, Firas Zahabi believes it’s an option. If this were to happen then he already has the best match-up in mind. That would be to take on UFC lightweight champion Khabib Nurmagomedov.